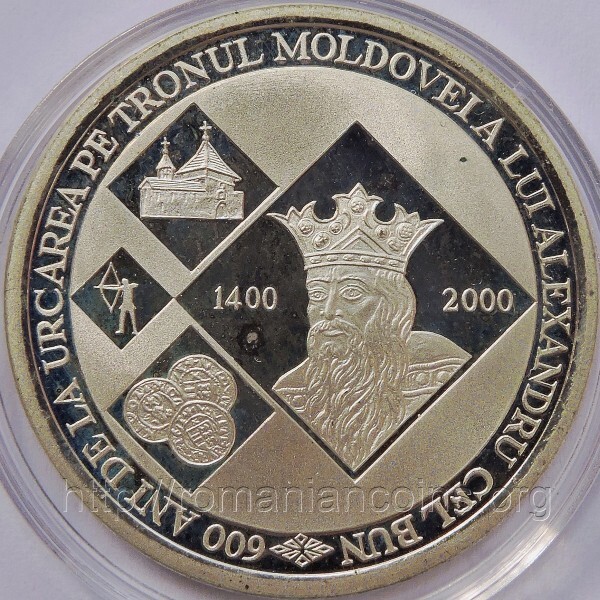 Obverse: denomination 500 LEI, ROMANIA, year 2000, Romanian coat of arms, and medieval seal of the Moldavian borough of Baia Reverse: bust of voivod Alexander the Good, Mirăuţi church in Suceava (first methropolitan cathedral of Moldavia), inscription "600 ANI DE LA URCAREA PE TRONUL MOLDOVEI A LUI ALEXANDRU CEL BUN" meaning "600 YEARS SINCE THE ENTHRONEMENT OF ALEXANDER THE GOOD"
Although the certificate of authenticity accompanying the coin states a maximum mintage of 1000 pieces, the press release of the National Bank of Romania from September 26th 2000 about the issues put it: "The mintage of the issue for sale inside the country is 1,000 pieces and for sale abroad the mintage may be supplemented with another 1,000 pieces". Alexander the Good ruled Moldavia between 1400 and 1432. This coin celebrates de 600th year passed since he ascended to political power. The bust was engraved following the portrait of the voivod painted during the 16th century on the monastery of Suceviţa (as fresco). The reigning prince is shown in half profile, long bearded and wearing Byzantine attire. His left hand points to a second plane church - the church of Mirăuţi. The Mirăuţi church from Suceava (capital of Moldavia at the time), dedicated to the Martyr Saint George, the victory bearer, was erected (most probably) in the time of Peter I Muşat. The same church hosted for a long time the seat of the Metropolitan, the head of the Moldavian church that was independent and had its own metropolitan since 1401. 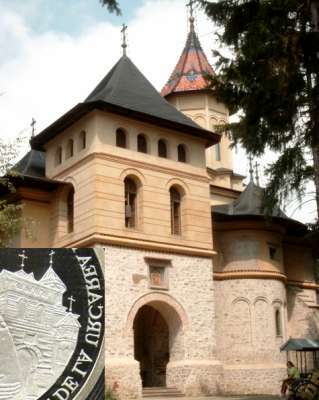 Here, on June 24th 1402, Alexander the Good placed the relics of Saint John the New of Cetatea Albă. Despite the popular belief, it is not Cetatea Albă (White Fortress) from the mouth of river Nistru (powerful Moldavian fortress, ancient Tyras), instead it is a homonym settlement in Crimea. About this event we read inside the chronicle of Grigore Ureche: "And in the year 6923 they sent that they brought with much expense the relics of Saint John the New of Cetatea Albă, from the pagans and set them in the borough, in Suceava, at the Metropolitan, with great honor and Mass, for the guarding and fending of his lordship's throne...". So the confirmation of chronicler Ureche makes it clear, it is "Cetatea Albă, from the pagans" - from Peter I Muşat on, the Fortress at the mouth of Nistru was no longer under pagan authority! Built anew once by Stephen the Great, the church was rebuilt in the 17th century and again in the 19th century. The latest consolidation was made in the years 1996-2000. The actual aspect is very different from the original one and church is fairly larger than in the beginning. 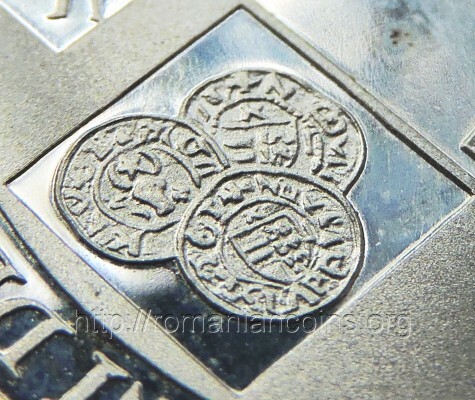 It is very interesting to observe that the representation of the church on the coin is faulty. In reality the belfry is placed on the southern part of the narthex (the church vestibule leading to the nave), the nave being placed at the right of the entrance, as it can be seen on the photograph taken in August 2005 by ourselves at Suceava (at left). If the scanned image of the coin reverse is mirrored, the correct position of the church is obtained (also at left). In which concerns the crosses atop the belfry and the tower, today they are placed in planes perpendicular on the church's great axis. On the coin they are placed in planes not parallel. This shameful error must have happened during the design process prior to engraving... The design chosen for the coin was obviously handed in after a digital mirroring processing. 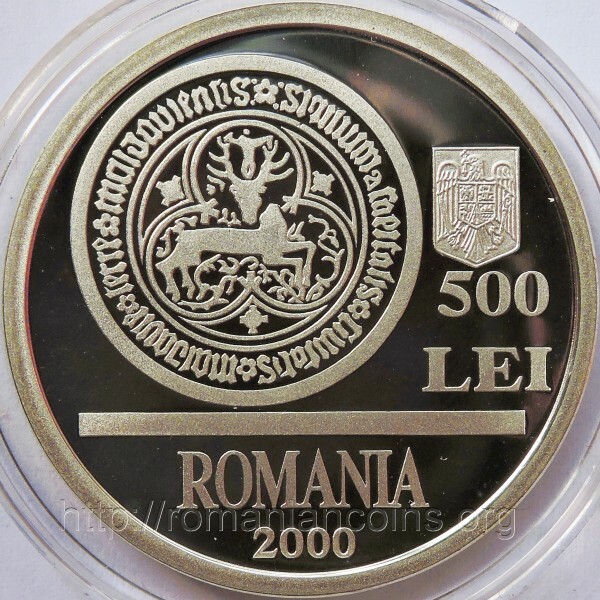 This qualifies the coin as the greatest design error that we know yet among all Romanian coins. It is quite unacceptable that nobody along the manufacturing line observed such striking mismatching. The coin was designed by Ştefan Ursachi and engraved by Vasile Gabor. On the obverse is represented the great seal of Baia town, with the stag with detached head, inscribed in a trilobated Gothic frame. The seal have a 5.3 centimeters in diameter and bear the Latin inscription sigillum capitalis civitatis moldavie terre moldaviensis, written with lower-case letters. This very beautiful seal was preserved on a document given by the şoltuz (burgomaster) Andreica and by the pîrgari (aldermen, members of the city council) on July 20 in 1590, for the sale of a part of the Ioneşti village. The stag with a crucifix (a cross with Jesus Christ crucified on it) between its antlers is the symbol of Saint Hubert, the patron saint of huntsmen. Today this saint is present on the Jägermeister label through the same symbol as on the seal of Baia. The Latin name of the town Baia is Civitas Moldaviensis, a.k.a. Moldova, was placed on the river Moldova, at 30 kilometers south from Suceava. The name of the city shows that in the past minerals were mined here (baie being an old word for mine). Baia was (in the 13th century) a rural settlement, being, in the 14th century, the first capital of Moldavia. The town was inhabited by Saxons (Germans) arrived here from the Transylvanian burgs Bistriţa and Rodna, by Hungarians and, of course, by Moldavians. In 1413 Alexander the Good agreed to the establishment of a catholic bishopric at Baia, erecting for the new bishop, the Polish John of Ryza, a beautiful and large stone church. At December 15th 1467 Stephen the Great defeated at Baia the army of Matthias Corvinus, the famous king of Hungary. The battle lasted the entire night, the town being torched by the Moldavians at the beginning of the fight to disarray the superior Hungarian forces. At the beginning of the 17th century at Baia there were 30-40 houses inhabited by catholic families, having two churches, and about 200 houses of orthodox people, having four churches. The Polish and Tartarian expeditions and raids that ravaged Moldavia in the time of Constantin Cantemir (1685-1693) were fatal for Baia, that became a mere humble village. Today Baia is only a commune in the Suceava county. 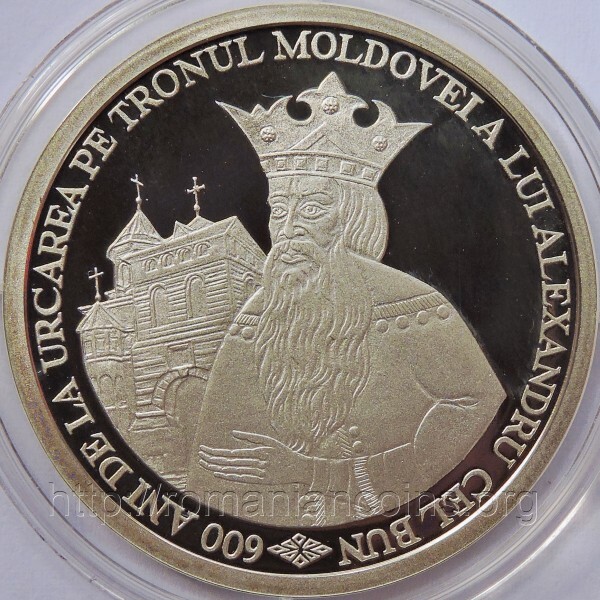 The great voivod is represented on a silver coin issued by Republic of Moldova: 100 lei 2000, dedicated also to the anniversary of 600 years since the enthronement of Alexander the Good. Below are the pictures of a pattern of Alexander the Good anniversary coin. 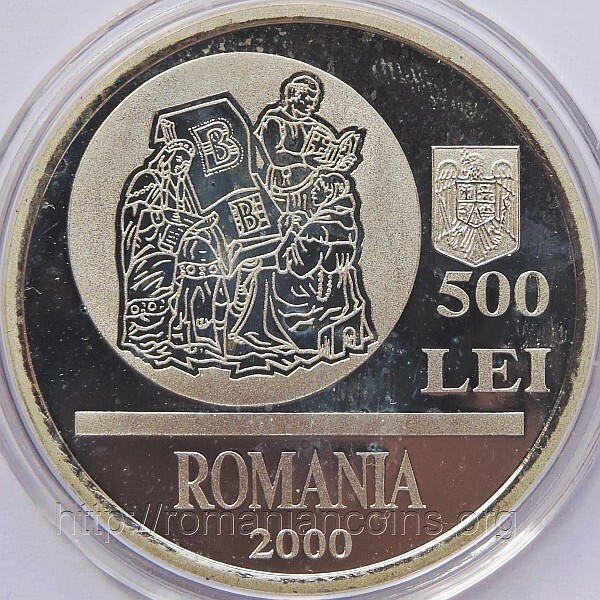 Avers: coat of arms of Romania, face value 500 LEI, ROMANIA, year 2000, a scene of medieval court life Revers: bust of Alexander the Good, years 1400 and 2000, a church, an archer, three Moldavian coins, inscription "600 ANI DE LA URCAREA PE TRONUL MOLDOVEI A LUI ALEXANDRU CEL BUN" meaning "600 YEARS SINCE THE ENTHRONEMENT OF ALEXANDER THE GOOD"
The patterns pictures above are present on Romanian coins through the kind permission of anonymous donors.